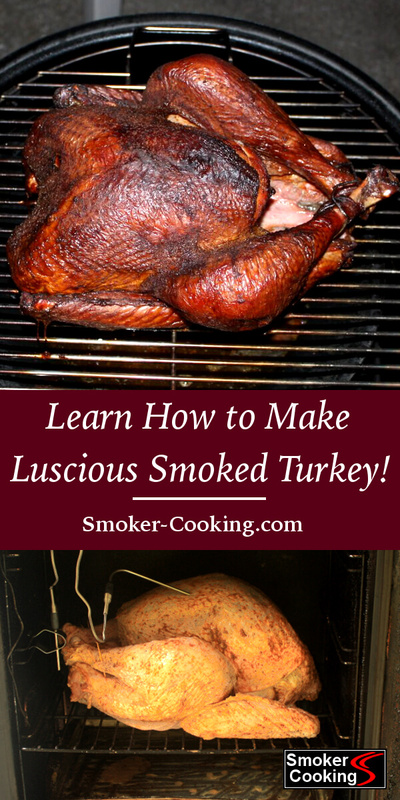 Make Smoked Turkey That Looks Good, Tastes Great! When you create a succulent smoked turkey at home, you'll not only feel satisfaction for a job well done, but you'll satisfy your hunger pangs with a gourmet treat. Smoking a whole turkey isn't easy, but the results make the effort all worth while. The picture below is of a turkey I cooked, just before it was served for the Thanksgiving feast. Smoked in a Weber Smoky Mountain Cooker, using apple wood for smoke, it turned out perfectly. Didn't last long, either. No Leftovers! For the best smoked turkey, start with one that’s fresh and minimally processed. Freezing causes cells in the flesh to rupture. When thawed, some of the juices drain out and are lost. Most frozen turkeys are processed by being injected with a brine solution, which helps the thawed turkey remain moist when cooked. But you don't want their brine in your smoked turkey…you want YOUR brine in your turkey! If availability or finances prevent you from buying a fresh turkey, use a frozen one. Try to get a minimally processed one if possible, but if you can't, that's OK. Just make sure that the turkey is completely thawed before going into the brine. Mix up a batch of turkey brine using your favorite recipe or a recipe from the Turkey Brine Recipes page here at Smoker-Cooking.com. The page Making Turkey Brine gives a detailed explanation on how this is done. Prep the turkey next. Remove the giblets and the neck from the body cavity and the neck cavity of the bird. Remove the excess fat from the edges of the skin. Leave as much of the skin on the bird as possible. It protects the meat from drying as it smokes. Rinse the turkey in cold, running water, making sure to clean the body cavity as well as the outside surfaces. Another important step of preparation is to separate the skin from the breast. Be very careful that you don't tear the skin as you pull it free. Slowly work it loose with your fingers, from the rear to front, and then down the sides toward the legs. Doing this allows the brine to reach the breast meat. Enjoy a Few Smoked Turkey Legs While Waiting For Your Turkey To Finish Brining! Now it's time to plop the turkey into the brine. I place it into the brine "head first". If it goes in "feet first", air may become trapped in the body cavity. The brine has to contact every part of the turkey, inside and out. 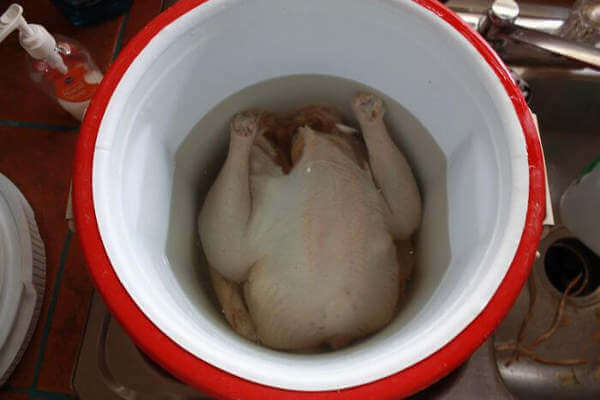 To keep the bird submerged, lay a heavy plate on top of the brine, inside the brining container. Gently slosh the turkey in the brine every couple of hours while you're awake. You want that brine to do its magic. Depending on the size of the turkey, brining can take from eight to twenty four hours. A ten pound turkey needs about eight hours in the brine. A fourteen pound bird will need about twelve hours. Anything larger may need up to twenty four hours. If you prefer a less-salty smoked turkey, brine it for a shorter amount of time. Try brining it half as long. Rinse it well, and let it rest overnight in the fridge. This will give time for the brine concentrated near the surface to move deeper into the turkey. Another option is to brine it for the full time, rinse it well, then soak it in fresh, cold water overnight (in the fridge) to leech out some of the salt. It's not a good idea to decrease the amount of salt in the brine recipe. Doing so will decrease the saltiness, but the weakened brine won't provide any moisture-retention or flavor-improving benefits. I recommend smoking a turkey weighing fourteen pounds or less. A larger bird will heat up more slowly, allowing micro-organisms a chance to multiply. I prefer birds that are nearer to eleven pounds, since they take less time to smoke. At the USDA - Poultry Smoking Basics page, you'll find good information about safe food handling and food smoking safety. After removing the bird from the brine, rinse it in cold, running water. Make sure you clean the body cavity in addition to the outside surface. Position the bird upright (as if it were dancing the turkey-strut) in the kitchen sink to drain. You want most of the water to drain from the body cavity. 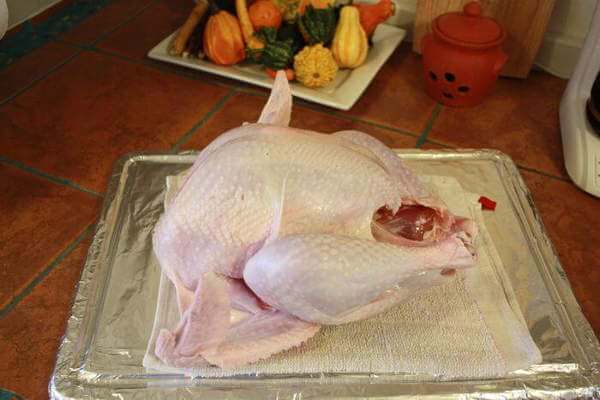 After five to ten minutes, pat the turkey dry with a towel to ready it for seasoning. Be careful if you use paper towels…they can disintegrate and stick on the turkey flesh, and the resulting mess can be difficult to remove. For the best texture and flavor, let the turkey rest uncovered in the refrigerator twelve to twenty four hours. This gives the salt and brine flavorings time to distribute evenly throughout the turkey. It allows the salt time to modify the proteins, which will improve the texture and moisture retention. Seasoning The Turkey With Extra Goodness! The brined turkey can be seasoned with a dry mix of spices and herbs, or with a wet rub. I use a dry mix in the cavity, but I prefer to use a wet rub on the outside surfaces of the turkey. I believe it adheres better, plus the oil in it improves the moistness and color of the smoked turkey. To make a wet rub, mix vegetable or olive oil into the dry ingredients until you have a thin paste. The trick to seasoning a brined turkey is to get the flavors under the skin. 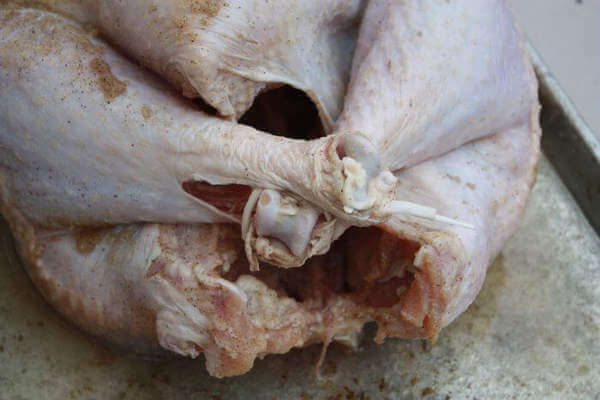 Remember when you separated the skin from the breast before brining? You were preparing it for seasoning at the same time. Again, carefully lift the skin and coat the meat with some of the wet rub. Try to completely cover the exposed flesh. Pull the skin back into place after you've seasoned the bird. I use a couple of toothpicks to hold the skin in place, since it shrinks as it cooks. You don’t want the meat uncovered as it smokes. Season the outer surface of the turkey with the remaining wet rub. Get into all the nooks and crannies…under the wings and legs. Next, flavor up the inside of the turkey with dry spices. After seasoning, I loosely truss the legs together with a length of butchers' string. Now it's ready for the smoker. 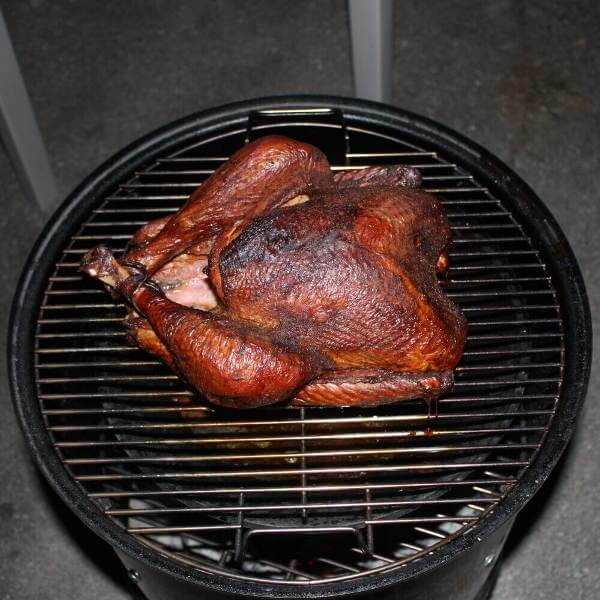 Get your smoker up to 225 degrees Fahrenheit before you put in the turkey. Oil the grate to prevent sticking. Maintain a temperature of 225 to 250 degrees throughout the smoking session. I like my smoked turkey to be kissed with a combination of oak and apple smoke, about half and half. Use two or three fist sized chunks, spaced throughout the session…you don't want it to be overpowered with smoke flavor. Baste the turkey with a little melted butter a few times as it smokes. Normally, it will need to smoke from 30 to 40 minutes per pound, but it could take longer. When opening the smoker to check internal temperature, to add more smoker wood or charcoal, or to baste the turkey the smoker temperature will drop. Open your smoker as few times as possible. Use a remote thermometer in the turkey to monitor it's internal temp, and if basting, do it quickly to minimize heat loss. Depending on the smoker, it can take up to 15 minutes to come back up to temperature. When the thick part of the thigh reaches 165 degrees, and the breast about 160, it's time to remove the turkey. The temperature will rise after removing it from the smoker. When the breast reaches 150F, cover it with foil to prevent it from being overcooked. All that remains is to cover the smoked turkey with a foil tent, and let it rest for at least one-half hour, breast side down, before slicing. This allows the juices and smoke flavor to evenly disperse throughout the flesh as it firms up. 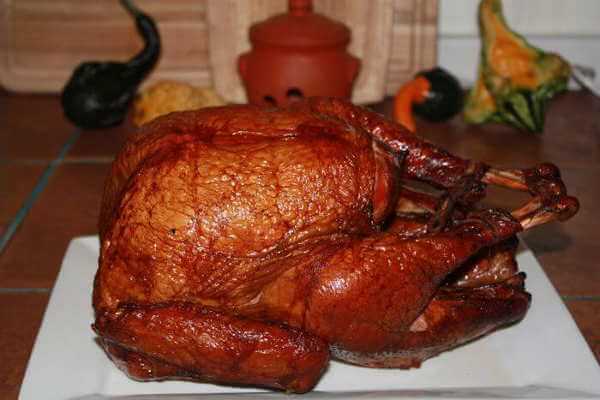 Smoked turkey is a wonderful smoky treat served hot or cold. I think the flavor actually improves after a couple of days in the refrigerator. 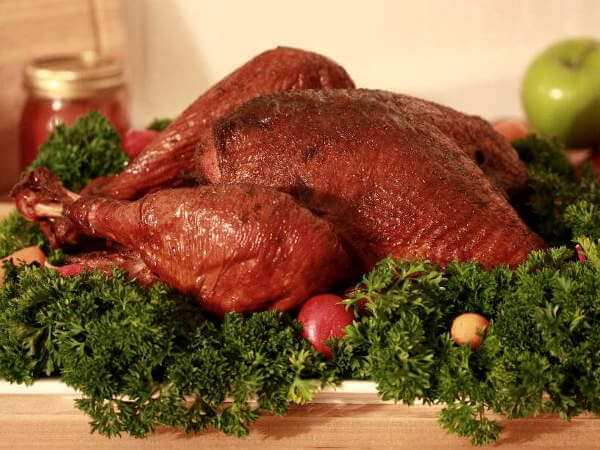 The smoked turkey can be eaten along with a traditional Thanksgiving meal, or any other meal, sidled up next to the mashed potatoes, corn, green beans, stuffing, and homemade bread. It's also great chilled, sliced thin, and served on an assortment of crackers and cheeses. Top these off with green or black olives, a thin slice of tomato, or a bit of avocado.